Joan of Bar: Abandoned Wife – History… the interesting bits! You would think that a man who was given a king’s granddaughter as a wife would relish the glamour and connections such a bride brought. However, this was not always the case and nowhere is it more obvious than in the life and marriage of Joan of Bar. Joan was the granddaughter of the mighty Edward I and his queen, Eleanor of Castile. Her mother was Eleanor, Edward and Eleanor’s eldest surviving child. Eleanor of England had been born in 1264 and was first married to Alfonso III, King of Aragon, by proxy on 15th August 1290 at Westminster Abbey. However the groom died before the marriage could be consummated and Eleanor married again at Bristol on 20th September 1293, to Henry III, Count of Bar. Henry and Eleanor had at least 2 children together. Their son, Edward, and daughter, Joan, were born in successive years, in 1294 and 1295. Although there seems to be some confusion of who was the oldest. A possible 3rd child, Eleanor, is said to have married Llywelyn ap Owen of Deheubarth; but her actual existence seems to be in question. As usual with Medieval women – even royal ones – we know very little of Joan’s childhood. Her mother died in Ghent in 1298 and was buried in Westminster Abbey, London. Joan’s father, the Count of Bar, died in 1302, sources say as a result of injuries received in battle while fighting in Sicily. The count was succeeded by his only son, Edward, who was then only 6 or 7 years old. 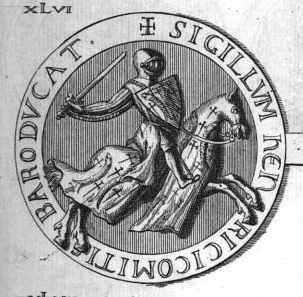 The county of Bar was run by his grandfather, Edward I, during young Edward’s minority, with the child’s uncle John of Puisaye and the bishops of Liege and Metz acting as governors. It’s possible the children came to live at the English court, or at least spent some time there. By 1310 Edward’s majority was declared. He married Mary, daughter of Robert II, Duke of Burgundy, in the same year. By this time, young Joan had already been married 4 years. In 1306 Joan had returned to England, arriving on 13th April. Barely 10 years old, she was escorted to the palace at Westminster with great pomp. During the parliament of 1306 Edward I had settled Joan’s future. On 15th May of that year Edward offered Joan’s hand in marriage to 20-year-old John de Warenne, 7th Earl of Surrey, who had recently been granted his grandfather’s lands, despite the fact he wasn’t yet 21. John was not without royal connections himself. His aunt, Isabella had been married to Scots King John Balliol, and their son, John’s cousin, was Edward Balliol, sometime King of Scots and John’s ward. John was the grandson of Edward’s good friend, also named John de Warenne, the 6th Earl of Surrey and former Warden of Scotland. 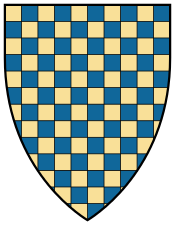 Young John’s father, William de Warenne, had died in a tournament within a year of John’s birth and so he was raised by his grandfather, until John Senior’s death in 1304. In the week following the betrothal of John and Joan, Edward I held a magnificent ceremony for the knighting of his eldest son, Edward. The ceremony was also to include the knighting of almost 300 men, John de Warenne included. As the celebrations continued a number of weddings also took place, involving several barons and nobles. John de Warenne and Joan of Bar were married on 25th May, with John’s sister, Alice, marrying Edmund Fitzalan, 9th Earl of Arundel, at about the same time. Edmund had been a ward of John’s grandfather. The 2 young men were very close in age and were political allies and friends. 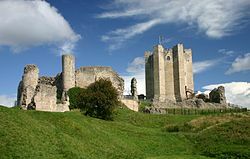 Following the wedding the couple lived on the Warenne Yorkshire estates, sharing their time between their castles at Conisbrough and Sandal. In the wider world, Edward I died in the summer of 1307 and was succeeded by his son, Edward II. Initially John de Warenne was a supporter of Edward; witnessing the charter which made Edward’s favourite, Piers Gaveston, Earl of Cornwall and accompanying the king to France to claim his bride, Isabella, daughter of Philip IV of France. However, John was not immune to the turbulence and distrust of Edward’s reign and changed sides several times in the arguments between the king and his barons. The uncertainty of Edward’s reign cannot have helped the marriage of John and Joan, but neither, it seems, did John. The couple was soon estranged – Joan was half John’s age when they married, which must have put an incredible strain on the relationship. There had been indications of problems as early as 1309, when the king had given John permission to name whoever he wished as his heir, as long as any children he may have by Joan were not disinherited. By 1313 the marriage was still childless, and blatantly unhappy. In the spring of that year, Edward sent his yeoman, William Aune, to bring Joan to the king. 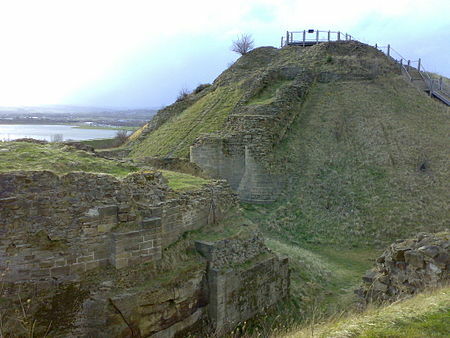 She was taken from Warenne’s castle at Conisbrough and lodged in the Tower of London, at the king’s expense. John, on the other hand, was living openly with his mistress, Maud Nereford, for which he was threatened with excommunication in May; a sentence which was finally carried out by the bishop of Chichester when Edward’s attempts to prevent it failed. A long legal battle followed, eager to marry Maud and legitimise his 2 sons by her, John attempted to dissolve his marriage to Joan on the grounds of consanguinity – they were related in the 3rd and 4th degrees. He also claimed that he was pressured into marrying Joan against his will. Maud added her own suit to the legal proceeding by claiming that John had contracted to marry her before his marriage to Joan. The church council registered disapproval of John and Maud’s relationship; as did a council of nobles which included the king’s cousin and most powerful nobleman in the land, Thomas of Lancaster. John had even been Thomas’s retainer in the early years of the king’s reign, but relations had soured following the murder of Gaveston in 1312. The case would drag on for 2 years, with John unable to find a friendly ecclesiastical court who would pronounce in his favour. In 1316 he agreed to pay Joan a sum of £200 annually while the suit was ongoing, and to provide Joan with lands worth 740 marks once the marriage was dissolved. As the hopes of an annulment faded, John enlisted the help of the earl of Pembroke in presenting a petition to the pope seeking an annulment. John also rearranged his estates, surrendering them to the king to have them re-granted with specifications that some of the lands could pass to his sons be Maud Nereford on his death. In the mean time, in August 1316, Joan had left England for France. While the troubles in England intensified, John’s marriage troubles seem to have abated somewhat. The rebellion of Thomas of Lancaster was crushed at the Battle of Boroughbridge in 1322, but war simmered on with France adding to the king’s troubles by demanding he personally pay homage for his French lands. In 1325 John de Warenne was appointed captain of an English expedition to Aquitaine and was away from home for the next year. Joan had been in France at the same time, spending some of her time with Edward II’s queen, Isabella, and eldest son Prince Edward. Some sources say that when Warenne returned to England in 1326, Joan accompanied him and they even received permission to go abroad in February 1327 – as a couple. Following the downfall of Edward II, his son and the new king, Edward III, in gratitude for her service to his mother, Queen Isabella, settled lands on Joan for life, and granted her some of the goods forfeited by Edmund Fitzalan. John’s erstwhile brother-in-law had been caught up in the turbulence of Edward II’s downfall and executed. John de Warenne proved a faithful servant to Edward III, acting as keeper of the realm, jointly with young prince Edward, during the king’s absences in 1338 and 1340. However, his domestic life was as unsettled as ever in the last years of his life. Joan was in his company and treated as his wife in the years between 1331 and 1337, but went abroad with her entire household in 1337 shortly after her brother’s death; Edward, Count of Bar, had died in a shipwreck on his way to the Crusades and its possible Joan was acting as regent for her nephew, Henry IV, Count of Bar. By the 1340s Maud Nereford and her sons had predeceased him, but John had a new lover in Isabella Holland, daughter of Sir Robert Holland, a leading retainer of Thomas of Lancaster. And it seems he was again contemplating divorce. In a 1344 letter from the Bishop of Winchester charges him to hold Joan in marital affection and honour the dispensation that had been granted for his marriage. Joan was abroad again, possibly acting as regent for her great-nephew, Edward II Count of Bar. Amid fears that John de Warenne would try to take Joan’s lands Edward III acted to guarantee them in her absence. By 1345, in one final attempt to dissolve his marriage John was claiming that he had had an affair before marrying Joan, with his wife’s maternal aunt Mary of Woodstock. This was indeed a drastic claim, as Mary had been a nun since she was about 7 years old, and was probably born out of desperation; John was getting increasingly infirm and still had no heir to succeed him. It was a last-ditch attempt to marry Isabella and have legitimate children. It failed, however, and John died at Conisbrough Castle between 28th and 30th June 1347, aged 61. His will, written just before his death and dated 24th June 1347, left various gifts to Isabella and his illegitimate children – but nothing to Joan, his wife. Warenne left several illegitimate children, including at least 3 boys and 3 girls. Joan de Bar was abroad when her husband died. She lived for another 14 years, retaining the title of Countess of Surrey until her death; Richard Fitzalan, John’s heir, took possession of the Warenne estates on John’s death, but didn’t use the title earl of Surrey until after Joan died. In the 1350s Joan is said to have often visited the French king, Jean II, who was a prisoner of Edward III in London. After a long and turbulent life, and at around 66 years of age, Joan died in London in 1361. Her body was conducted to France by her valet. 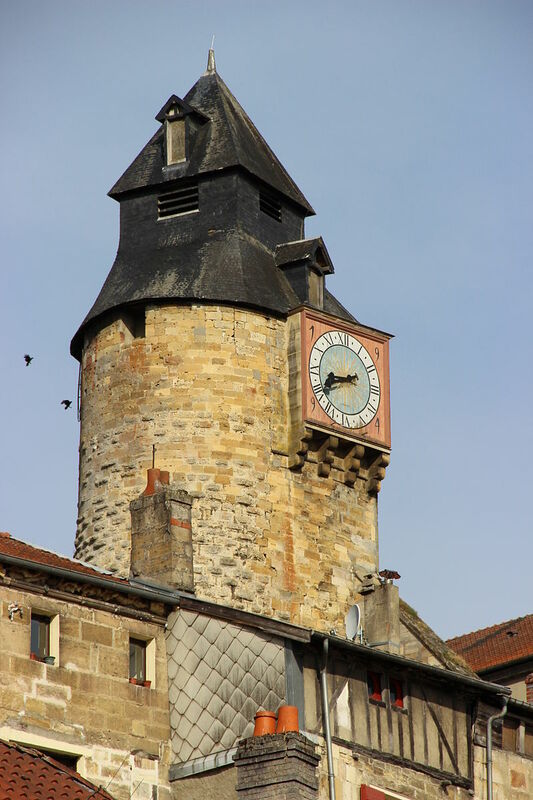 She was buried at Sainte-Maxe Collegiate Church in Bar-le-Duc in October 1361. Sources: The Oxford Companion to British History Edited by John Cannon; The Plantagenets, the Kings who Made England by Dan Jones; History Today Companion to British History Edited by Juliet Gardiner and Neil Wenborn; Brewer’s British Royalty by David Williamson; Britain’s Royal Families, the Complete Genealogy by Alison Weir; Early Yorkshire Charters Volume 8, Edited by William Farrer and Charles Travis Clay; Conisbrough Castle by Steven Brindle and Agnieszka Sadraei; The Mammoth Book of British Kings and Queens by Mike Ashley; The Plantagenets, the Kings that made Britain by Derek Wilson; oxforddnb.com; royaldescent.net. my middle name is LaBarr, i’m named after my great grandmother…Ruth LaBar. i wonder if there is a connection to the county Bar? I think you have a typo in the paragraph beginning “By the 1440s Maud Nereford…” I think you meant “1340s”. Great article, thank you. Pingback: The Kidnapped Countess – History… the interesting bits! More and more I am reading historucal fuctiin books where facts mingle and often I have either read or (as of right now) reading about certain historucl characters, in this case, not Joan but Edward 111, so it is all tying togethet nicely. Thank you Sharon. Pingback: Gundrada, Daughter of Debate – History… the interesting bits! Pingback: Conisbrough Castle – it’s Life and History – History… the interesting bits! Pingback: The Man who Won the Hand of the Fair Maid of Kent – History… the interesting bits! Pingback: My News – History… the interesting bits!